Cruciferous vegetables - the family that includes broccoli, cauliflower, Brussels sprouts and collard greens - contain special phytonutrients which are not found in any other foods and which may lower the risk of certain destructive agents which pose very aggressive threats to our well-being. Cancer Institutes and Health Organisations throughout the world recommend eating one serving of cruciferous vegetables every day, but most of us only eat one serving a week. 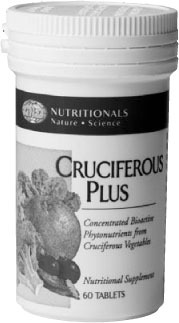 Each Cruciferous Plus tablet provides the phytonutrient value of an optimal serving of a wide variety of cruciferous vegetables. Research has shown a link between a high consumption of cruciferous vegetables and a low risk for encountering certain destructive agents which pose aggressive threats to overall well-being. Cruciferous vegetables contain unique phytonutrients (plant nutrients) that are not found in any other foods but that are essential for optimal well-being. Cruciferous vegetables contain substances shown in research studies to help strengthen the body’s defences. Cancer Institutes and Health Organisations all recommend consuming one serving of cruciferous vegetables each day. Broad-spectrum cruciferous vegetable supplementation. Each tablet provides the phytonutrient value of one optimal serving of a wide variety of cruciferous vegetables. GNLD’s exclusive cruciferous blend contains broccoli, radish, kale, black mustard, brown mustard and watercress. Cruciferous Plus supplies other beneficial phytonutrients - limonene from oranges, chalcones from liquorice root and isoflavones from soybeans - which research has shown can be beneficial for healthy cells in the body. Contains sulforaphane, an important phytonutrient in cruciferous vegetables that helps neutralize many aggressive and damaging agents. Research shows that sulforaphane can help protect against major threats to our well-being. Whole food ingredients provide several important phytonutrients with benefits to our general well-being. 100% Naturally occurring ingredients. Cruciferous Plus contains no artificial colours, flavours, preservatives, or sweeteners. Convenient serving - just one more way to help you meet the recommendations of Cancer Institutes and Health Organisations to consume one serving of cruciferous vegetables every day. We should eat one serving of cruciferous vegetables every day, according to Cancer Institutes and Health Organisations. We actually only eat one serving a week, according to research findings.